You can wear them without fear of razor marks or embarrassing stubble. And no worrying about new growth or if you've waxed before going out in public. Because Stop Grow™ by Skinception™ is scientifically formulated with a series of active ingredients that interrupt follicular cell activity along the body, with long-term reduction of unwanted body hair! Until one day, don't be surprised if you don't need to shave at all! Unwanted Growth Disappears Where Ever You Choose! Is it an issue for you when people spot embarrassing hair in your under arms when wearing a halter top or t-shirt? Perhaps it's your legs or somewhere more private. Stop Grow™ prevents body hair, before it develops, where ever you choose. With its gentle formula and Skinception™ – based understanding of human skin, it's as suitable for you face as it is for your legs. Or the special areas you share with a limited audience. Choose to reduce hirsuteness in one area or several at the same time. You prioritize the areas where you want to reduce and inhibit that unwanted body hair! So body hair is reduced before it sprouts up! Most women report a noticeable reduction of body hair beginning in just 4 weeks. 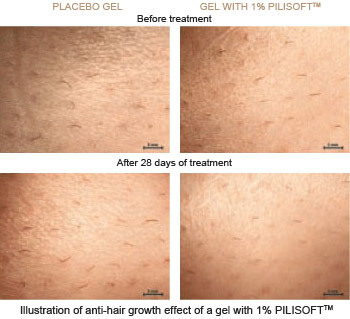 Even more encouraging, unwanted body hair becomes so sporadic that Stop Grow™ is clinically proven* to reduce frequency of leg shaving in women by up to 82%! Get Body Hair Before it Sprouts Up! Stop Grow™ is scientifically formulated with the most recent development in prevention of unwanted body hair. And the numbers speak for themselves. It's proven to keep it off - on a continuing basis! You Must LOVE The Results Or We'll Refund Your Money! Check this out... We're so sure you'll LOVE the results you get with Stop Grow™, we offer an unmatched rock-solid 67 day moneyback guarantee. No tie ins. No weird billing. No loop holes. You must love the results, or we'll refund 100% of your purchase price minus shipping and handling charges. That's an unheard of guarantee for ANY hair removal product, but that's how strongly we believe Stop Grow™ will work for you. We take all the risk on our shoulders so you feel confident trying it yourself. the results may vary from person to person. Please try our product for 90 days (3 tubes) and if for any reason you are not 100% satisfied, simply return the three empty tubes within 97 days from the time of delivery for a full refund excluding shipping charges. Refunds will be sent using the original payment method. If you wish to take advantage of the price discount by ordering multiple tubes don't worry. Any unopened tubes returned along with your first three opened tubes within the 97 day guarantee period will also be eligible for a full refund. How can we make this incredible guarantee? Because we KNOW you will be satisfied with our product. Please do not ship any product back after the 97-day refund period has expired. Returns must be received back at warehouse within 97 days of delivery with no exceptions. Please feel free to try our products, but refunds are limited to one order per customer. Please correct the highlighted field.